This is a Plug and Play Unit that has been designed to improve the performance of your FIAT 500T. It is designed with OEM Connectors and works with the electronics of your 500T to increase power and engine response. We have this module installed in our own car and can verify that it fits and works as promised. The manufacturer states that the unit typically ads between 25-40 Horsepower to the ABARTH and slightly less for the 500T . This version of the module will come with a pre programmed Radio Remote Controler. With the Remote Controller you willl be able to switch from the Race Tune - (button #2) to Performance Tune - (button #1) down to stock (button #1). You can select to turn off the module and have the car operate at the stock factory setting. You can select to up the power of the car to a more aggressive tune that will provide your 500T with an increase in power and torque or you can choose to select a third level which the most aggressive setting maximizing the power upgrade to max. By adding on the Radio Control Module you will have full control of the performance of your 500T at your fingertips. This Radio Controler Module will arrive pre programed to your MM Engine Module and will be ready to use. It is about the size of a regular keyfob and can be easily attached to your keychain. The remote is designed to integrate seamlessly with your Magneti Marelli Engine Control Module. The redmote is included in this listing. We have this optional remote controller with the Magneti Marelli Engine Control Module on our own car and can truly tell the difference. The difference is night and day and in our opinion the optional remote is a great option. Without the remote your module will arrive with the 70% Race Tune Preset. You will not be able to switch back and forth between tunes. With the Remote you will be able to switch back and forth as often as you choose (please make sure the car is in stationary position when you switch). A. Magneti Marelli is a FIAT Company and works hand in hand with the engineers of FIAT. By doing so they are able to design and manufacture what is considered by most to be the best tuning module available on the market. The module is designed to work seamlessly with the FIAT Electronic Management System. This unit is fully programmable and can offer you a variety of different tunes to get just the right amount of performance and fuel economy. A similar unit to this one was featured in the ABARTH Venom Concept Car and was tuned to generate approximately 200 HP! While you will not get that kind of a gain with this unit and your 500T, the difference will be significant. The unit will come preprogramed with the 0-stock, 40% - Performance and 70% - Race Tune. If you are using the Radio Remote Control you will be able to switch back and forth between the settings as you like. If you are getting the unit without the remote control your unit will be set to the 70% - Race Tune. A. There are many good tuning kits available from various companies, but also many very bad ones which may cause serious damage to your engine leaving you out of pocket for hundreds or even thousands of dollars! 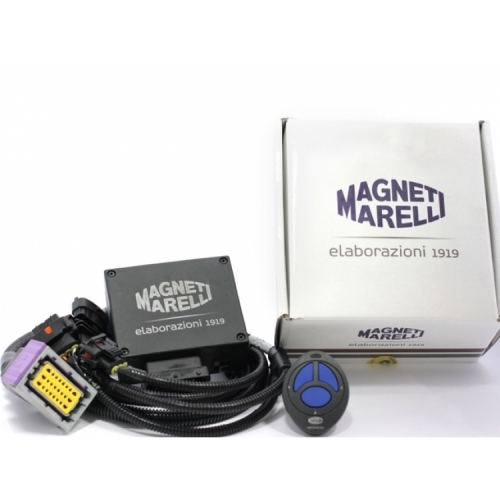 The Magneti Marelli Engine Module is manufactured by MM which is a FIAT Company. This is considered to be one of the best, if not the best tuning modules available for the FIAT 500T. A. It should not (per MM). Magneti Marelli units are specifically designed for the FIAT 500 ABARTH. This module is not a generic solution that has been modified to work with the 500T. It has been designed from scratch specifically for the North American Version of the FIAT 500T by Magneti Marelli which is an official FIAT Company. If you use the module as designed it should not have any negative effect on the power train of the vehicle.